Last Tuesday, December 18, 2012 was my son’s class Christmas party. He had a lot of things to bring to school that day which includes fried chicken, his food contribution to the party, and his gifts to his homeroom adviser, his classmates, teacher aides and janitors. I thought I could take a picture of him and his classmates during their party, but I was mistaken. Even if it wasn’t a regular school day, the pupils’ classrooms and hallways were still off-limits to parents and yayas. 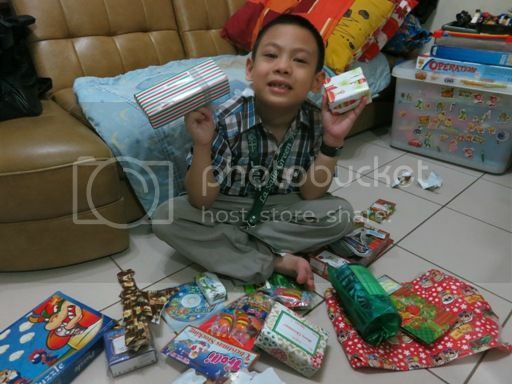 The only picture I had of him on that day was this one taken at home where he was opening all the Christmas presents he received from his classmates. This entry was posted in Big School, Kinder 2. Bookmark the permalink.